This is the last of the four Signatory bottles I purchased at Binny’s in September. I’ve previously reviewed the Glen Keith and Tamdhu that are Stoller’s Wines exclusives and the Auchroisk that, like this one, is a Binny’s exclusive. All four are still available. 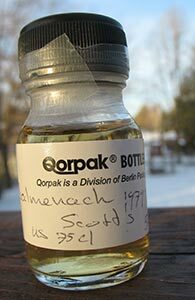 Balmenach, in the Speyside, is another not very well known distillery. It is part of the Inver House group along with more famous stablemates Old Pulteney and Balblair. It doesn’t get official releases as a single malt and so once again we must look to the indies, and once again to Scott’s Selection. I read a rumour recently, by the way, that Scott’s Selection is closing down as a label. Too bad if it’s true, though it does explain why nothing new seems to have come from them to the US in some years.